There was an old Lady who Swallowed a Bell by Lucille Colandro is a wonderfully funny Christmas book that we added to our 12 Days of Christmas book and craft countdown. I read this story to the boys with the help of an old lady prop. In the story, the little old lady swallows Christmas items one by one. We dropped those items right into her mouth! The story ends when the lady whistles and everything comes out. The objects she swallowed are now a decorated sleigh full of toys, pulled by reindeer, ready for Santa. I orignally found this ideas during the fall for the book on Pinterest. This activity could easily be used with any of the "Old lady" books. I used our big trash can from the laundry room. I cleaned it out first! But it looks like they used a small can. I often see those at the dollar tree and they would probably be good for the classroom use. My boys did love their "lifesize" "kidsize" old lady! 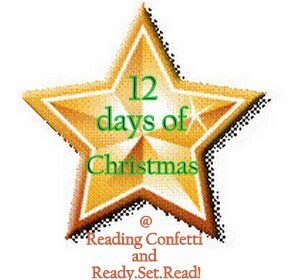 This is day 11 of the 12 days of Christmas books and crafts/activities at Reading Confetti and Ready. Set. Read. Oh, how fun! I bet everyone had a blast with this. My kids in elementary school would even think this is fun! I'm sharing this in a few places today. I hope a few families give this a try. Parents playing with their kids is beautiful. You are creating such happy memories. This is so fun!! I am a homeschooler and will so be doing this with my kids! Great idea! I'd love for you to link up to my Christmas Linky Carnival. That's an awesome idea! I will keep this in mind for next December when I have my own class to plan for! Oh my goodness -- too precious for words! This is pretty funny and cute. Thanks for linking up.